Families First. What it has been. What it should be. This month marks a year since Christy Clark became Premier. She won the Liberal leadership with a “Families First” campaign. It held much promise for the generation raising young kids. Their household incomes have stalled despite the dramatic increase in dual-earner couples since 1976. Stalled incomes must cope with housing prices that are up 149 per cent over the same period; pay back larger student debts; and often pay another mortgage for child care services. Struggling with a dramatic decline in their standard of living, “Families First” seemed like the right response for a generation that is priced out, time poor, and ignored by policy. One year later, “Families First” is more slogan than commitment. The Premier delivered one extra holiday in February, which she postponed. Families don’t have to pay for parking when visiting provincial parks. And the Premier slowed Hydro rate increases out of respect for family budgets. Such changes barely scratch the surface of the generation’s sinking standard of living. 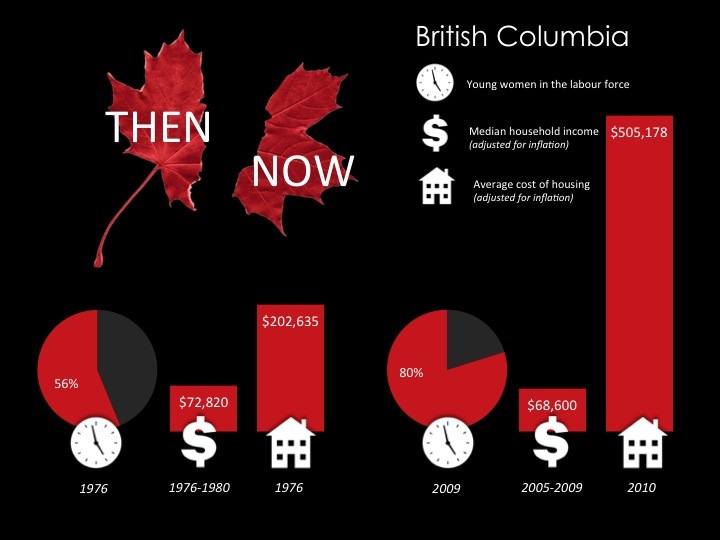 They remain SQUEEZED — for time at home, income after housing, and services like child care. Jobs have been the dominant focus for this “Families First” Premier, because she correctly observes that jobs are critical for family well-being. But let’s be clear. Jobs alone have not proven sufficient to sustain the standard of living for those who follow in the footsteps of the Baby Boom generation. Even two jobs haven’t. That’s why household incomes for Canadians under 45 have stalled despite the rise in dual-earner homes! Minimum wages are something for which the new Premier deserves credit. She raised the minimum to $10/hour, despite controversy. However, the living wage campaign shows the bare bones wage required to support a family of four in many of the province’s larger cities is nearly twice as high. Influencing wages and housing prices is a difficult business for policy makers. But ensuring that it does not cost parents the equivalent of a second mortgage to split 18 months at home with a newborn, or a third to pay for child care services are definitely things we can achieve through social policy. Many other countries do, including those with a better dept/GDP ratio than Canada. Before one presumes this a partisan critique, last year gave little evidence that the official opposition will prioritize a New Deal for Families in the next election. Nor are federal parties moving in this direction. Which brings us back to a dominant problem for generations under age 45. Their relative disinterest in politics means many don’t call for political solutions to the fact it has become harder to raise a family. Nor do many Boomers seek a better deal for their kids and grandkids. I think the problem rests partly with policy wonks like me, keen to describe what “Families First” should mean in terms of policy reform. I routinely talk about New Mom and New Dad Benefits, $10/day child care services, and a shift from 40 to 35 hour weekly employment norms as part of a transition to shorter work years in exchange for longer work lives. For most, such talk doesn’t inspire. People want to know how policy reform will influence their daily lives. Time. Enough time to listen, laugh, not just react. Time with the kids, as opposed to rushing between work, appointments or play dates. Time to swap less healthy take-out and pre-packaged food for wholesome meals cooked at home, eaten together. Heck, there might even be enough time to get our hands dirty in pots on the balcony, or in a small garden to reconnect with local food and mother nature. And there certainly would be enough time to find fun with our significant others, and not just prepare for the rat-race tomorrow. Values. “Families First” should maintain the family at the heart of Canadian values, while acknowledging the diversity in households from coast to coast. Values that prioritize spending more time together with family and friends, while spending less on stuff. Confidence. Knowing that success on the job and success at home aren’t mutually exclusive aspirations. That work-life balance is a genuine reality for men and women, not just some fiction we talk about. Community. Child care services will become a community hub, responding to the nostalgia many feel about relying on neighbours next door. Programs will support all families: one earner couples, dual-earners and lone parents. They will provide stimulating environments for kids that supplement, but never replace, what parents do. Services that give parents the confidence to know their kids are well cared for while they grapple with the reality of stagnant wages and high housing prices – challenges that didn’t exist a generation ago. Security, for all generations, including Boomers. Sure, incomes are up on average for Boomers compared to those retiring a generation ago, as is their wealth in housing. But many Boomers want to help their kids and grandchildren cope with the rising cost of living. Not surprisingly, they worry about the impact on their retirement finances. A New Deal for Families would ease this pressure, organizing policy so that enough parental time at home and child care services don’t cost second and third mortgages. Boomers’ kids will therefore be in stronger positions to manage higher housing prices and student debt on their own. Responsibility. “Families First” still means people do all they can to pay for and care for their own. But when the generation raising young kids works more employment hours and more unpaid caregiving hours than other Canadians, as they do now, their impressive work ethic should generate a standard of living that better approximates what their parents enjoyed. Pride that hard work pays off for you and your kids. Not the status quo, which means less time, less disposable income, more government debt, and global climate change. Nor the shame and resignation many in Gen Squeeze quietly concede because they are left to cope with a declining standard of living that is ignored by federal and provincial policy makers.